FPCC has always been a leader for post tensioning of radial gates anchors in Dams allover India. Dam is a structure, which is basically constructed to store water for hydropower generation. Prestressed anchors are used to connect the trunion girder to pier of dam.Trunion girder is a part of the radial gate assembly to which the trunion assembly & arms of the radial gates are connected. 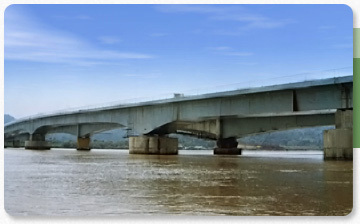 Trunion girder is a structure made of steel or concrete. It is not monolithic with the dam pier. This structure is connected to the dam pier by using prestressed cable anchors.The prestressed cable anchors are designed to withstand the active force of water on the radial gates & also to counter the force required to lift the radial gates. Freyssinet Unbonded cable anchors are recommended to be used for radial gates anchoring. The unbonded cable anchoring system helps to monitor the forces in the prestressed cable anchors & do the necessary adjustment if required in future.